Access: On the Menu bar, click Process > Processing Options..., in the Processing Options pop-up click 3. DSM, Orthomosaic and Index. Grid DSM: Allows the user to select the output file format for the Grid DSM. Raster DTM: Allows the user to select the output file format and options for the raster DTM. Raster DTM Resolution: Allows the user to define the spatial resolution used to generate the DTM. Contour Lines: Allows the user to generate the contour lines using the Raster DSM or the Raster DTM and to select the processing options for the contour lines. XYZ: ASCII text file with the X,Y,Z position and color information for each point of the Grid DSM. LAS: LiDAR LAS file with X,Y,Z position and color information for each point of the Grid DSM. LAZ: Compressed LiDAR LAS file with X,Y,Z position and color information for each point of the Grid DSM. Grid Spacing [cm]: The spacing defines the distance between two 3D points in the Grid DSM and is given in centimeters. For example: a grid spacing of 100 centimeters will generate one 3D point every 100 centimeters. The default value is 100 centimeters. One DSM with the selected spacing is generated in addition to a DSM generated using the resolution selected in the DSM and Orthomosaic tab. Note: It is possible to select more than one format to save the Grid DSM in more than one formats. Note: The Grid DSM is restricted to 256 million points. If the chosen grid spacing or resolution generates more than 256 million points, then the grid sampling or resolution distance is doubled until the number of generated points does not exceed 256 million. Allows to generate the raster DTM. For more information about the concept of DTM: What is... (a densified point cloud? an orthomosaic? etc.). Important: The option to generate the raster DTM is only available when the options Raster DSM and Merge Tiles for raster DSM are selected. For more information about the options of the raster DSM: Menu Process > Processing Options... > 3. DSM, Orthomosaic and Index > DSM and Orthomosaic. Merge Tiles (activated by default): Generates a single DTM GeoTIFF file by merging the individual tiles. When this option is not selected, the merged DTM file is not generated and the contour lines are not using the DTM. Allows to define the spatial resolution used to generate the DTM. Automatic (default): By default, the resolution is set to 5 X GSD. One can also easily change the resolution to multiples of the GSD. Custom: Allows to select any value higher than 5 X GSD, for the resolution of the Raster DTM. Allows generating contour lines using the Raster DSM or the Raster DTM. Raster DTM, if it is already generated. For more information about contour lines, using the DTM: Contour Lines using the DTM. Raster DSM, if the raster DTM is not generated or if the DTM tiles are not merged. For more information about contour lines, using the DSM: Contour Lines using the DSM. Note: If step 3. DSM, Orthomosaic and Index has already been processed and the DSM or DTM are generated, it is possible to generate the Contour Lines without running step 3 again. For more information: Menu Process > Generate Contour Lines. For step by step instructions on how to generate contour lines: How to generate the Contour Lines. Important: The option to generate the contour lines is grayed out if the option to merge the tiles of Raster DSM is disabled. 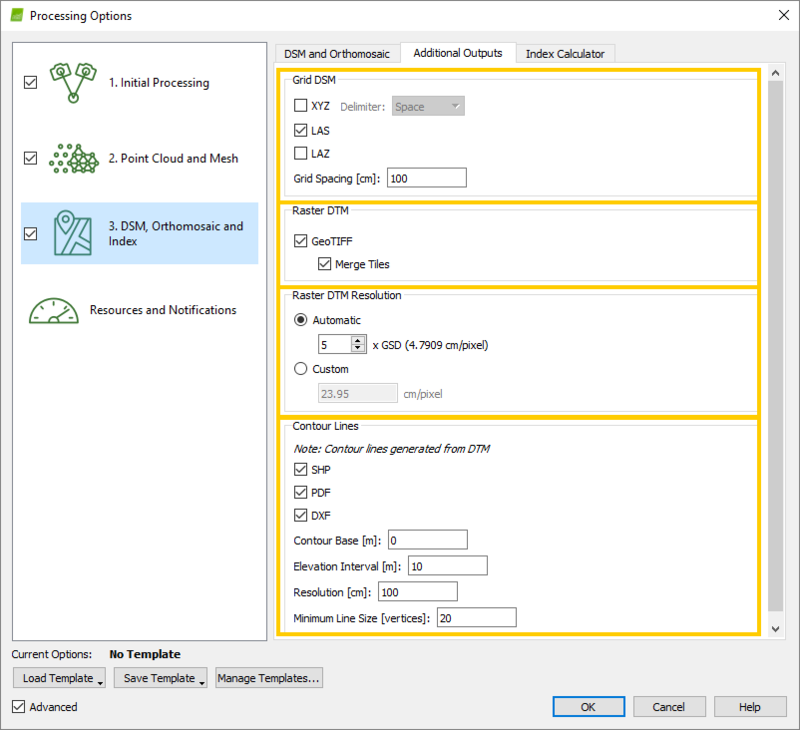 For more information about the options of the Raster DSM: Menu Process > Processing Options... > 3. DSM, Orthomosaic and Index > DSM and Orthomosaic. SHP: When this option is selected, the contour lines file are exported in .shp format. PDF: When this option is selected, the contour lines are exported in .pdf format. DXF: When this option is selected, the contour lines file are exported in .dxf format. Note: It is possible to select more than one format in order to save the contour lines in multiple formats. Contour Base [units]: It defines the reference altitude from which contour lines are generated upwards and downwards. It can be in meters or in feet according to the coordinate system used. Elevation Interval [units]: It defines the contour line elevation interval. It can be in meters or in feet according to the coordinate system used. It can be any positive value. Warning: The Elevation Interval must be smaller than (Maximum - Minimum) altitude of the DSM/DTM. Note: The smaller the Interval value, the larger the size of the contour lines file and the more processing time will be needed for its generation. Example: The Contour Base is used as a starting point for contour lines generation. Contour lines are generated, based on the selected Elevation Interval, upwards and downwards from the Contour Base. Contour Base = 0 and Elevation Interval = 1 the first contour line will be at 315 meters, the second contour line at 316 meters and the last one at 350 meters. Contour Base = 0.5 and Elevation Interval = 1 the first contour line will be at 315.5 meters, the second contour line at 316.5 meters and the last one at 349.5 meters. Contour Base = 327 and Elevation Interval = 10 the first contour line will be at 317 meters, the second contour line at 327 meters and the last one at 347 meters. Resolution [units]: It defines the horizontal distance for which an altitude value is registered. The higher the Resolution value, the smoother the contour lines. Example: If the Resolution is set to 100 cm, an altitude value will be registered every 100 cm horizontally. Minimum Line Size [vertices]: It defines the minimum number of vertices that a contour line can have. Lines with fewer vertices will be deleted and less noise will be produced. Example: If the Minimum Line Size [points] is set to 20, all contour lines that have less than 20 vertices will be deleted.